Click on the Question below to revel the answers..
What is 3-IN-ONE Multi-Purpose Oil? 3-IN-ONE Multi-Purpose Oil is a specially formulated lubricating oil. 3-IN-ONE Multi-Purpose Oil’s unique set of ingredients enable it to lubricate as well as protect metal surfaces. 3-IN-ONE Multi-Purpose Oil’s easy-to-use drip spout allows you to apply the product right where it’s needed most. What should I use 3-IN-ONE Multi-Purpose Oil on? Use 3-IN-ONE Multi-Purpose Oil on in-line skates, tools, bicycles, rollers, wheels, skateboards, fans, hinges and moving parts…nearly everything that moves. Two unique spout options enable you to apply 3-IN-ONE Multi-Purpose Oil to the exact spot needed. 3-IN-ONE was developed in 1894 for use on bicycles. The inventor, George Cole, was hoping to create a product which would lubricate, clean and prevent rust. Those three functions in one product led to the name. What is the difference between 3-IN-ONE Multi-Purpose and 3-IN-ONE with added PTFE? 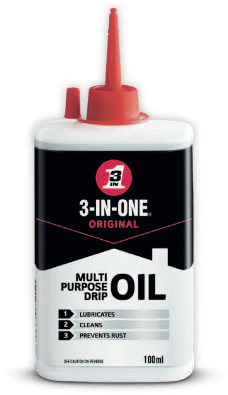 3-IN-ONE Multi-Purpose Oil is a precision lubricating oil for a variety of uses from lubricating moving parts to preventing rust. 3-IN-ONE with PTFE comes in an aerosol and the addition of PTFE delivers outstanding lubrication and longer lasting protection. This formula is ideal for chains, cables and gear mechanisms. i.e. bicycles. Is 3-IN-ONE a detergent or non-detergent oil? Both 3-IN-ONE Multi-purpose and Motor Oil are non-detergent oils and neither of them contain silicone. Where can I buy 3-IN-ONE oil? 3-IN-ONE is available through most leading automotive, DIY, grocery and multiple retailers as well as industrial distributors. If your store or distributor doesn’t carry 3-IN-ONE, please ask them to add it.